In the last blog , we have described HRMS contents and its classification, sources, format, and what type of contents can be generalized and which cannot be, and derived which content can be part of HRMS Built-in-Contents. In this blog, I want to discuss the relationship between Contents and HRMS Implementation Time as I have been asked many times in the past, how long does it take to implement Interact HRMS. The answer to this question is not straightforward as it depends on many variables/parameters, and most of all the Complexity of HR and Payroll Content and its Quality. Thus, Implementation Time of HRMS is a direct function of Contents Complexity and Quality. Thus, the more complex is the contents, the more time it will be required to implement HRMS. Similarly, the lower the quality of the contents the more time will be required to Implement HRMS. In this blog, we are intending to demonstrate this relationship Contents Complexity and Quality and HRMS Implementation Time. The Complexity and Quality of each of the above contents will affect the time it takes to complete the implementation of the system (HRMS). The remaining of this blog will explain why these two measures of the contents that do effect the implementation time of HRMS. Complexity of the contents is an indicator or a metric that can be used to measure how difficult it is to discover and define the contents, and to setup the contents after it is defined. The Complexity of the contents is a multi-dimensional variable as it encompasses the discovery of a content element, definition of a content element, and relationships between content elements. If we consider the contents as a system, which consists of multiple sets and subsets of content elements, and where the sets are related through a number of relationships, and subsets are related to each other as well as to various sets. Then, the complexity of the contents can be measured by the number of sets, subsets, relations and complexity of relation, and the cardinal of each set and each subset. Complexity applies to the first three categories of contents, Company Foundation, Company HR and Payroll Policies, and Country Labor and Tax Laws. Quality of the contents is used to measure completeness of the contents and its accuracy and applies to all four categories of contents. Contents Complexity – Can be partially controlled, specifically the client internal policies to make such policies easier to implement and setup. While External Labor and Tax Laws complexity cannot be controlled by the client, and there is nothing the client can do to change these policies/laws. Contents Quality – Can be fully controlled by the client, and the client need to ensure that the data to be used in the setup/implementation is accurate, complete, and properly defined, so that the setup is not repeated as this will affect the implementation time. How long does it take to implement and deliver an HRMS system depends primarily on two primary factors, (1) Contents Complexity, and (2) Contents Quality. If the Contents is very complex and Contents quality is very poor, then the implementation/setup time will be very large. On the other hand if the contents is simple and straightforward and the contents quality is very good, then the implementation time will be small. 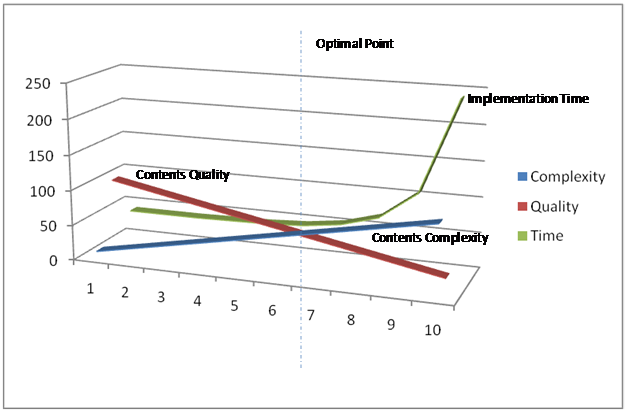 So when planning for the implementation of an HRMS system , we need to pay attention to these two factors and how to mitigate the risk associated with the Contents Complexity and Contents Quality, so that the implementation time is optimized and under control, otherwise we may risk to have a very long implementation/setup time that can impact the success of the project as well as the cost. Of course, there are other factors that can impact the implementation time, and these include planning, lack of participation from all stakeholders, lack of domain knowledge, lack of system expertise/know-how, and others. But the greatest impact on the implementation time is the contents complexity and quality of the contents. Finally, there is no equation, where plug specific value for each variable and then come out with the number of months that it will take to implement and deliver the system (HRMS). The project manager responsible for the planning of the system implementation, based on his expertise and knowledge gained from other implementation projects, conducts an assessment of the of the client’s foundation data, policies, country’s policies, client business structure, client resources, and provider’s resources, and derives the level of the contents complexity and contents quality, as well as the risk associated with other factors that may affect the project implementation time, then he/she determines how long it will take (how many months) to implement and deliver the system. Initially, the implementation that is determined by the project manager is only a rough estimate, then as the project implementation commences, and the project manager starts to comprehend and understand the detail of the contents and its complexity and quality, adjustments are made to the implementation time. At 2Interact, we recognize how critical is HRMS implementation time and time to delivery to the success and the cost of any HRMS project. Thus we are constantly developing new and improved tools to assist the implementation team to analyze contents complexity and quality, and to identify critical baseline data and contents that may impact the implementation time and time to delivery, so these can be addressed early in the project life during the discovery phase of the project, so the implementation time and time to delivery are shortened.